Ok, so let's do this. Let's check out some black houses!! A great way to break up an all black house is with stone. 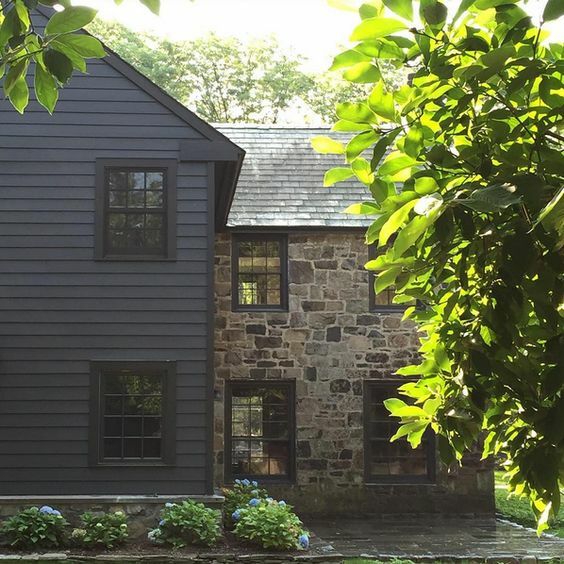 You may already have a home that has a great stone so why not try putting up a black paint swatch to see if your home and you can handle a black house. The stone helps give the black some life. Of course with any color, there are so many options. Any paint you are planning on painting make sure to put samples up. A lot of blacks when you put them up might have a purple or brown undertone, which of course you don't want. A nice inky black is what I would be striving for. A modern take on a traditional farm house situated on an old civil war site in nashville, tennessee. I PARTICULARLY like the mix of the metal awning with the stone and black. This stone gives me the feel of an old english cottage combined with the worn wood shingles. I like the SEPARATION of the lower level with the stone. Another great way to break up an all black house is with white. It doesn't get any more classic than black and white. It provides a high contrast, but also brightens the house up. Reminicent of an old english home, but with some modern aesthetics. if you think this is beautiful, you need to see the rest of the exterior and interior of the home. The interior was designed by Alexa Hampton. a modern rustic danish cottage with a simple, yet eye catching kitchen. a craftsman bungalow in black with a curved door and pergola? ummmmm, yes please!! Another great way to break up black, but in a more modern, crisp way, is with a nice warm wood tone. I'm sure you've seen black and wood inside a home, well why not carry it out to the exterior of your home? The exterior of your home should set the tone for the inside, so it's all cohesive. I'm loving all the different widths of the vertical lines on this house. Between the main part of the house, to the second floor, to the metal roof, yet somehow it all works. You will be shocked to see what the other 3 sides of this house look like. knowing that this house is designed by bob and courtney novogratz, this exterior will be the only neutral part of this house. It's like a sorbet before your dinner. It cleanses your palate before the real invigorating meal, the interior. A houseboat? Sure why not. If you watch HGTv's fixer upper then you know this is a killer before and after. 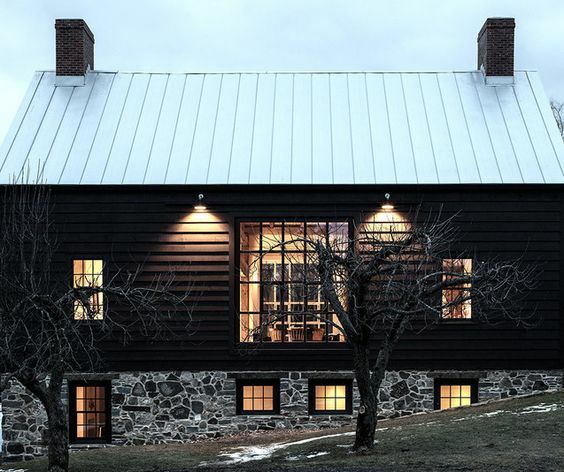 What makes this exterior so unique is the wood is not painted, but has a treatment called shou sugi ban. shou sugi ban is an ancient japanese exterior siding technique that preserves wood by charring it with fire. which makes it the perfect treatment for a house that will be getting wet. Alright, so now that you've gotten warmed up to the idea of a black house. Why not take it ALL THE WAY?! Wait, is that from a movie? Sports? Anyway, an all black house should still be broken up with perhaps the trim in a different sheen, or maybe a completely different black color. The black materials on the house may be different, or maybe you've run materials in different directions. No matter what you do, do something. Break up the black somehow. Something as "small" as the house in a more matte finish and the trim in a more high gloss will define the spaces and your home. the large wall of windows help break up the darkness of the black. your green plants will pop off black. But what I think will really pop off the black is chartreuse green plants like potato vines. So, have I sold you on your own black home yet? If so, you might be interested in this next house. This is the HGTV Dream Home 2018 that you could win. You need to see this before and after to see how a blah beige house turned into this stunner. Again the power of of windows breaking up a space. I want to thank you so much for taking the time to read this, but mostly for following along on this journey with me. I'm so ready for this year and more determined than ever to bring you some pretty spectacular spaces that will hopefully inspire you as much as they inspire me.